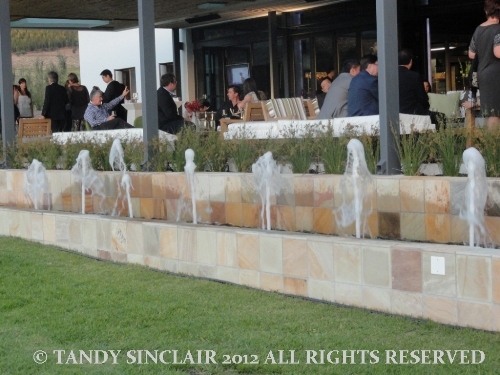 Edit: Liam Tomlin is no longer situated at Leopard’s Leap. The blog world is going to be buzzing with reviews on this amazing evening, and I am sure that the print media will soon follow. I received an email with a save the date request and was then asked which day suited me. I chose the Thursday, expecting an invitation to a lunch time affair and was most surprised to be invited to an evening function – dress code cocktail, and with a partner. It was fantastic that Dave was extended this invitation as I would not have gone without him. Being the ever practical person he is, Dave booked us in to a guest house one kilometer away. I was so glad he did, as we could enjoy every moment of this evening late into the night. We arrived promptly at 7pm, me in a little black and white number and Dave dressed up (read long pants and a long sleeved shirt). The majestic building greeted us, together with staff offering us a cocktail. I am not sure how many waitrons were in attendance but each person we came across was well groomed, polite and efficient. If you put your plate down, it was whisked away seconds later. And I never had an empty glass! While sipping on our cocktails we walked around the impressive dining hall, reading lounge and the shop. Cooking heaven! The shop has kitchen gadgets, spices and books, loads and loads of books. The wine is displayed on racks and there is even an old fashioned step ladder on castors so that you don’t have to go on your tip toes to reach what you are looking for. We then found the chef’s table dining room, and I cannot wait to spend a lazy Saturday afternoon enjoying the experience. We exchanged our cocktail glasses for wine glasses and headed out to the lovely appointed balcony to sit comfortably watching the sunset. 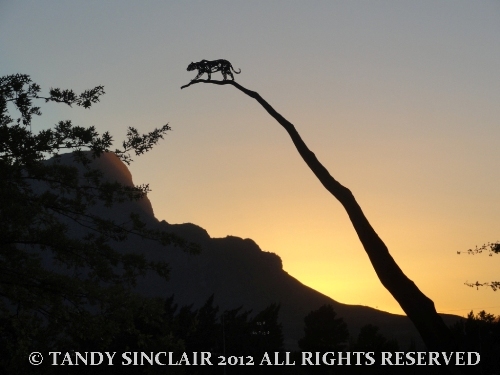 The sun dipped behind the mountains, and as twilight disappeared, the grape vines were lit up by subtle green lighting. These vines were planted by Hein’s father 12 years ago, and the wine is fantastic. 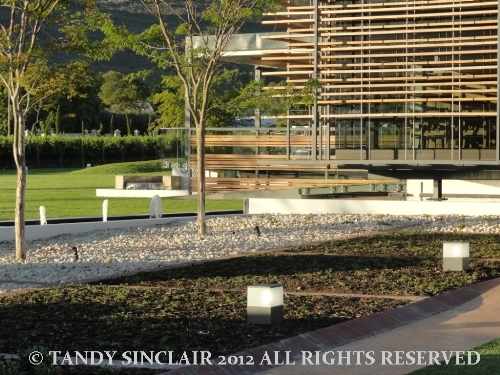 We tried the Sauvignon Blanc, Shiraz and Merlot. Dinner was not expected – a cocktail party made me think we would get canapés but we were treated to 8 mostly wonderful courses. 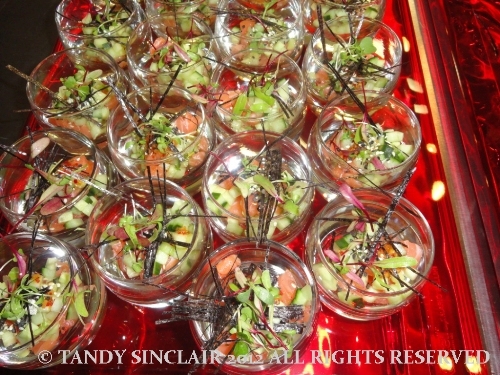 The well appointed kitchen had been set up in 8 sections, with two chefs at each section preparing and plating the dishes. At no stage was there a mess anywhere – the chefs were constantly wiping down their surfaces, a compliment I passed on to Liam himself. 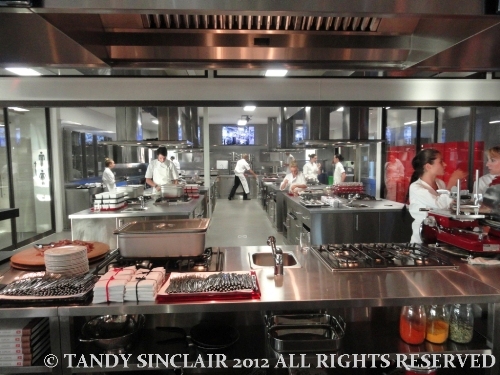 As he said, “they are good chefs”, but it is their training and leadership that makes them such. 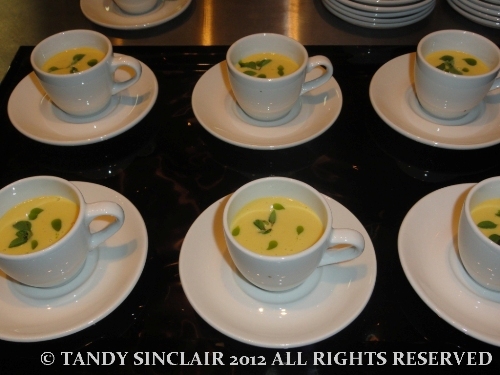 We started with a sweetcorn and basil velouté and I loved it. I could have had a dozen more, and I was so impressed by the silky smooth texture, that I tried to recreate this at home the weekend afterwards. I will share my version with you next month. 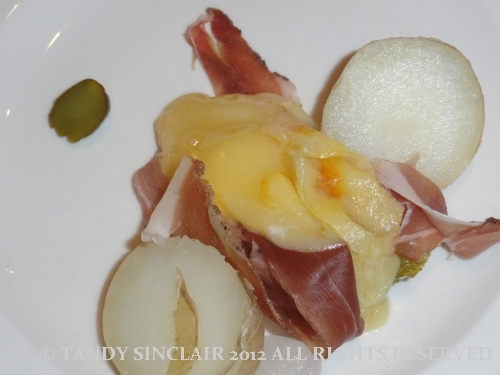 The soup course was followed by raclette and prosciutto with baby potatoes. Half a wheel of cheese was placed under the heat, and then the melted top was scooped onto the potatoes and reminded me so much of our trip to Germany last year. It was served with baby pickled onions and gherkins. 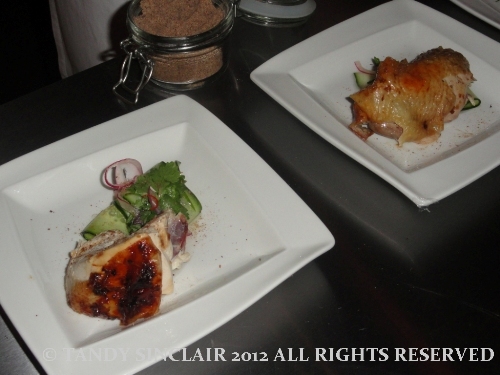 Our next course was a rotisserie szechaun chicken and we could see the chickens being cooked and then carved up and lovingly plated. This dish was judged by Dave and I as the best savoury dish of the evening and we had second helpings after dessert. We then moved on to what was the first of two disappointing seafood courses. 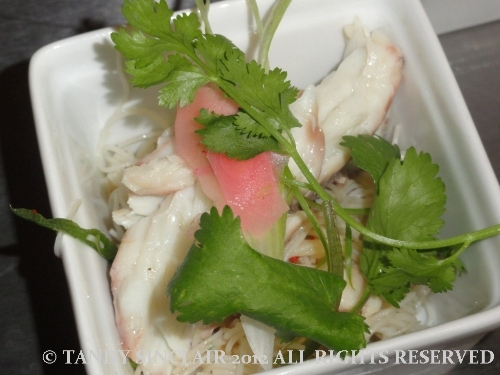 The steamed sea bass with vermicelli noodles had bones in it. We had to do a fair amount of extraction. Also, I am not a big fan of sea bass, it is an imported fish with not much taste, and I would so much prefer our local fish being showcased. 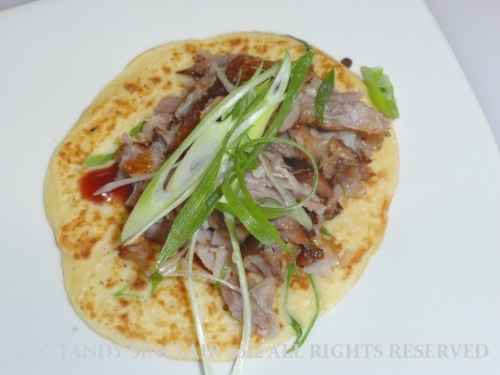 Our next delightful dish was a spring onion pancake with roast belly of pork. I could have had a plateful of them, all nicely rolled up ready to pop into my mouth. I however stopped at one. This was followed by seared salmon with avocado togarashi dressing, which was overpowered by the sesame. It was such a pity, as salmon and avocado have such gentle flavours, and they are a great combination. Our last meat course was a duck saucisson which took Dave and I right back to our trip to France where we were in duck country. This was reminiscent of the rough duck pâté’s we enjoyed. 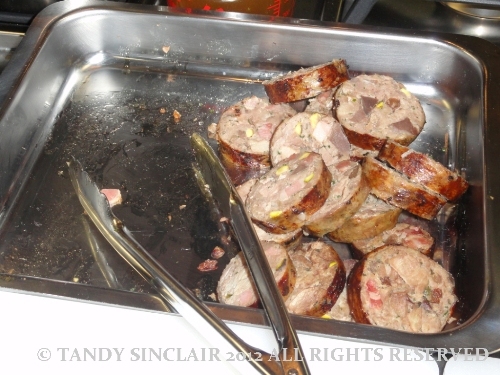 The saucisson was prepared in the skin from the neck of the duck. Now, dessert time! And not one, or two, but three sweet tastes to follow. I had my first taste of a recipe I have been wanting to try for some time, and now I have no reason not to. 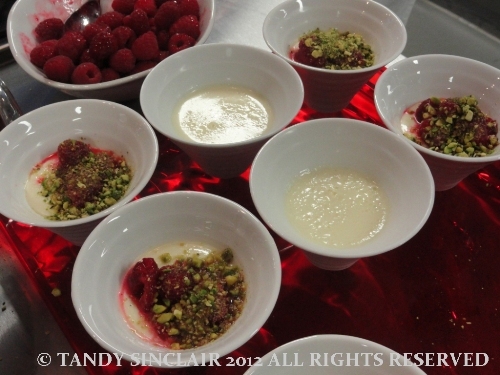 The lemon posset with raspberries and pistachio was sublime. I could have (should have) had the whole tray! This dessert was followed by Bailey’s Irish cream parfait with cocoa crunch. 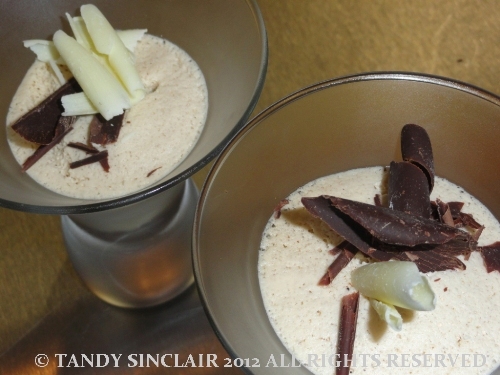 It was not as sublime as the posset and it was boozy! Some people were clambering for more chocolate, but were told that there was not enough. Dave and I decided to get a plateful more of the chicken before heading off to sample the truffles. 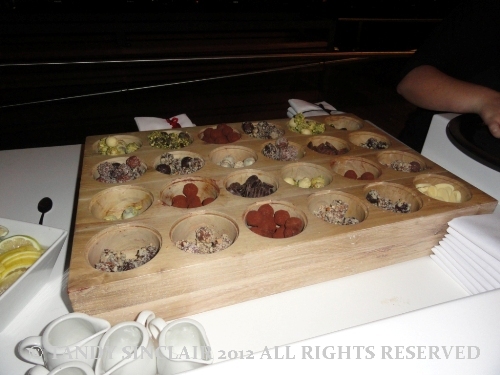 Dave chose one each – we have no idea what they were as no-one could tell us the flavours. But, they were made on site and were divine. I had one that was especially good and so stopped there with the food for the evening. After we had enjoyed our food, our wine, and our coffee, we were offered cigars (no thanks) and Cognac (yes please). 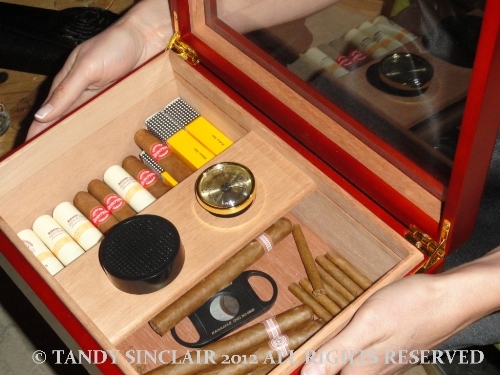 The staff just mingled among the guests, silently offering the humidor and the Cognac without intruding. A bit of confusion reigns about which door leads to the men’s and which to the ladies. We had a great debate about this, and Liam has suggested some earrings for the lady. Needles to say, there were men and women using both rooms! 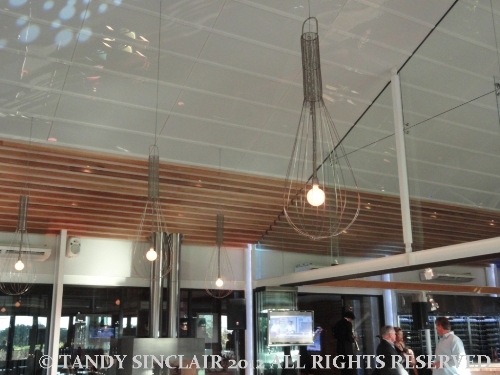 The wire whisk chandeliers caught my eye on so many occasions and when I downloaded my 137 photographs, most were of them. That and the center chandelier of grape leaves, over the wine tasting station will leave a lasting impression, together with the tables that teach you about meat, cheese and knives. I want these for my kitchen! I cannot get too effusive or enthusiastic about how awesome this venue is. I am already planning on doing a few of the cooking courses and Dave will join me for those. There has been a serious investment here, and you will love your visit. Click the link for more information on Liam Tomlin Food. Disclosure: I was invited to the opening. I was not asked to write a blog post about my experience. This post is in line with my blogging policy. Thanks for sharing your wonderful evening with us. All the food looked wonderful (sorry about bones in the fish). Very smart to spend the night close by…we often do that. Wow! This is all amazing! Oh Liam Tomlin used to have an amazing restaurant here in Sydney and I had to do a double take when I saw his name here. I had read that he was overseas but it’s nice to hear where he is now! Oh Tandy, everything looks so nice and tasty. Thank you so much for sharing such a lovely evening. It sounds like you had a wonderful time and all the pictures looks amusing….. I am going to have to make those pancakes at home 🙂 I really hope they do the earring thing! 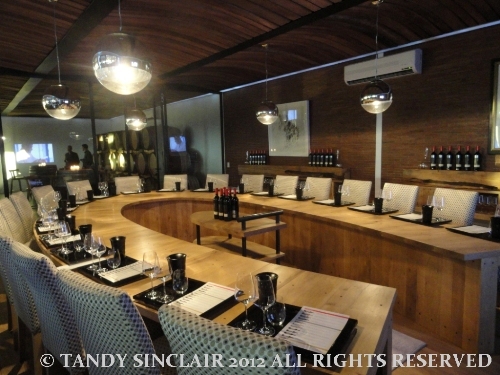 Tandy, fantastic review: eight courses! In that wonderful place! I am envious, but your writing did them justice…. What such a lovely evening, Tandy! The foold looks really good, pity about the bones though. Wow Tandy, what a remarkable and fun evening out! Brilliant review! Beautiful first pic – and wow I’m craving that duck sausage. What an amazing evening that must have been, the food looks wonderful.